The Supreme Court today (Wednesday, Feb 6) reserved its order on petitions seeking review of its judgment allowing women of all ages to enter Sabarimala Ayyappa temple. A five-judge Constitution Bench, headed by Chief Justice of India Ranjan Gogoi and also comprising also comprising Justices RF Nariman, AM Khanwilkar, DY Chandrachud and Indu Malhotra, heard the matter for over four hours. Interestingly, the Travancore Devaswom Board (TDB) that manages the Ayyappa temple did a U-turn today to say that women of all age groups should be allowed to pray there. 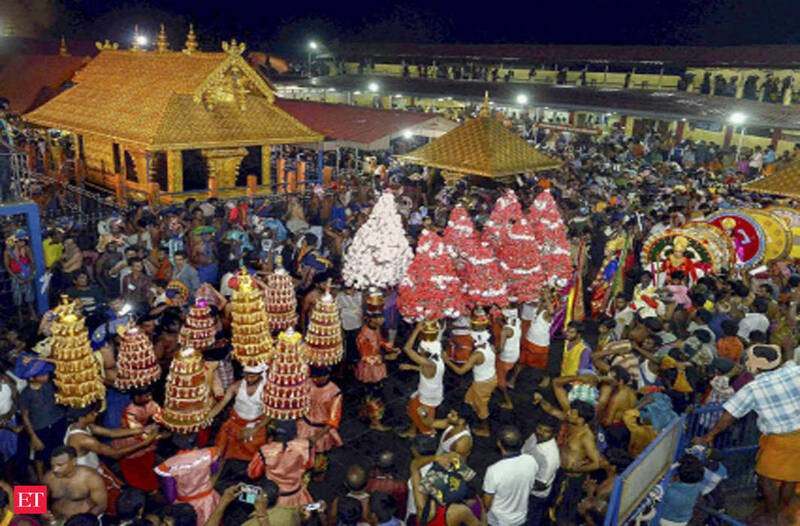 The Devaswom Board told the apex court that it has no objection to the entry of women inside the temple and urged the people to “gracefully” abide by the apex court’s verdict. “People who are opposing entry of women in 10-50 age group in Sabarimala temple should accept the SC verdict gracefully and allowing entry of all women inside temple,” Devaswom Board told SC. The board, which also comprise state government nominees, told the Constitution Bench that it is high time that a particular class not be discriminated on the ground of “biological attributes”. “Article 25 (1) equally entitles all persons to practice religion,” senior advocate Rakesh Dwivedi, appearing for TDB, told the Bench. “Women cannot be excluded from any walk of life on biological attributes … equality is the dominant theme of the Constitution,” said Dwivedi adding that people should gracefully accept the apex court verdict. Speaking to reporters later, the TDB chief said that the board accepts the top court’s September 28 verdict and believes that there should not be any discrimination. “Based on the verdict (September 28) we have decided not to file a review petition. The board accepts the SC verdict and if of the opinion that there shouldn’t be any discrimination,” TDB president A Padmakumar was quoted as saying by news agency ANI. Several organisations including the Nair Service Society (NSS) and the Thantri of the shrine, have sought reconsideration of the verdict. During the hearing, the petitioners argued that the court cannot force its views upon the people of Kerala who, it said, have not accepted the verdict. The petitioner also claimed that the apex court’s verdict has resulted in disturbing the social peace in the state. Appearing for the chief priest or Thantri of the Sabarimala temple, senior advocate V Giri reiterated that right to pray has been in consonance with the nature and form of the deity. He argued that the restriction in Sabarimala had been based on the character of the deity. Advocate VV Giri argued that any person who asserts right under article 25(2)(b) to worship has to do it in consonance with the nature of deity. The Kerala government, however, opposed the review petition, saying that it was in agreement with last year’s verdict and urged dismissal of petitions seeking review of the verdict. Advocate Jaideep Gupta, appearing for the Kerala government, made it clear that the government was opposing the review petitions as no grounds had been made out for review. The state government said that the ban on women entry is not part of “essential practice of Hinduism” which have the protection of the Constitution of India. Gupta asserted that essential practice of religion and essential practice of a temple cannot be confused and that exclusion of women from a temple was not essential to Hindu religion. “Every temple may be having its own practice. Court cannot go into the essential practices of every temple. That would mean each temple is a denominational temple. That will lead to the destruction of essential religious practise test,” he argued. He also told the bench that it should not consider the tension and violence that followed the judgment. “That social peace has been destroyed is not a ground for reviewing the judgment. Constitutional invalidity cannot be permitted to go on,” he argued. “Social harmony will ultimately prevail in the state,” the state government told SC.